thank you for sharing this Susannah, I’m heading to the end of my thirties and feeling more together than before. I’m looking forward to exploring my forties. 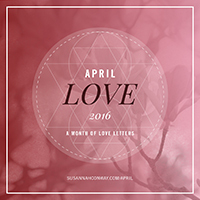 Thank you for April Love – I’m actually writing poetry for the first time in my life! I don’t think I would have done that without your prompt! Thank you for sharing this, Suzi! So very sweet and kind! What an amazing example for how all of us can treat ourselves compassionately. Deep gratitude for you! Oh, my heart. Susannah, thank you for sharing, again, and always, the truth of how it feels to be human – and for modeling such fierce kindness toward your self. It’s an inspiration. So sweet! I resonate with some of the same feelings. So nice to grow up! To be human is to relate, even though our journeys may look very different. I so admire and appreciate your honesty and vulnerability, thank you. I’m also in my 40’s and feel very connected to your thoughts on this part of your life. My biggest revelation over the past several years, is how sensitive (highly) I am. Embracing this side of myself has been liberating and empowering, and I too sense a new me on the horizon. I wish you the best! Oh my goodness Susannah. So much of this resonates so deeply with me- especially your 30 year old self and 40 year old self. Thank you so, so much for sharing. When I entered my 40s last year, it seemed there where very few people who spoke the same language as me. Who were processing the same feelings as me-loving this stage of life, but also realizing it’s maybe not how we had imagined it being. Not being regretful one bit, and loving this crazy life, but also processing the sadness of some things that are not going to happen. Finding your voice and words are a breath of fresh air. Susannah, how refreshing and honest. Such compassion you have for all of you. You have learned well from your younger selves and it is a force to be reckoned with that not everything we imagined will come to be in our lives. I love the way you express gratitude and inform us all with your hard earned wisdom. Oh my goodness! So beautiful and tender and brilliant. This was amazing!! I’m always amazed when I meet 30-year-olds who aren’t a hot mess — they’re like unicorns to me. Thank you, thank you, thank you! As with all of your writing, this is beautiful and tender and touching. What a wise woman you have become, thanks to all your younger selves!